Born: 1747 and died 1785. 1. Harriet Moore nee Henderson (1779-1866). 2. No other daughters. Did he have any sons? 1. The book "Records of the Carrick Moore Family" by George Heath, 1912. 2. A number of his portraits in the National Portrait Gallery, London. 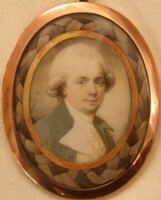 John Henderson know as "Bath Roscius" a rival and successor to Garrick, was of Scottish extraction and born in 1747. He acted the parts of Macbeth, Hamlet, Falstaff and many others. While at Bath, he received only one guinea a week, but later achieved a high reputation. He was mainly instrumental in popularising that famous ballad "John Gilpin". By his will he left £40 per annum to his mother. A portion for the education of his only daughter Harriet, afterwards Mrs James Moore. Balance to his widow. A set of books and 1st editions of Shakespeare to his Exors. 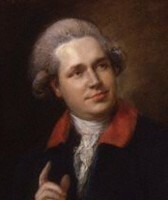 Henderson died of fever at the early age of 38, in 1785, and was buried close to Garrick in Poet's Corner. His granddaughter Julia presented to the National Portrait Gallery in 1895, the portrait of her grandfather, which had been "painted by his friend Thomas Gainsborough RA". There appears to be a number of portraits of John Henderson. There are six versions in the National Portrait Gallery London and one in the Victoria & Albert Museum London.